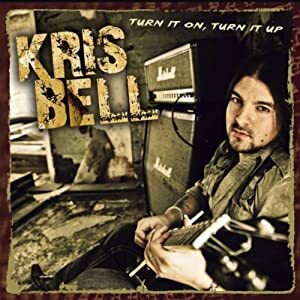 Rock is alive and well and can be found in abundance on Kris Bell’s new album, Turn It On, Turn It Up. The singer/songwriter/guitarist, originally from San Diego, moved to Nashville in 2005 and was soon hired as American Idol runner-up Bo Bice’s lead guitar player. Now Bell is focusing his attention on his solo career with his recently released new album. True to its title, the record is a mix of straight ahead, full throttle rock anthems and power ballads. All 11 tracks included here were written and co-produced by Bell. Starting things off with the amps cranked up is “Livin’ for Tomorrow,” which sets the tone for the rest of the album. “I’m livin’ for tomorrow/I’m not lookin’ back on yesterday/And I’m movin’ forward today,” Bell declares on the fast-paced opening song. From this moment on, listeners are given ample warning to expect plenty of catchy hooks, sing-a-long choruses and copious guitar solos. Throughout the record, Bell mixes modern, alternative and Southern rock to create his own American rock style. While the majority of the album is filled with up-tempo, all-out rockers, a handful of slower power ballads are sprinkled throughout as well, including, “I Know The Sun Will Call.” Enhanced with a sparse but beautiful string arrangement and its catchy chorus, the Creed-like song is one of the albums’ finest and most memorable moments. Another highlight is “Destined,” which is the album’s only stripped-down acoustic number. Here, Bell is accompanied only by acoustic guitar and strings as he delivers the heartfelt lyrics that sound as if he is reading a letter to his parents about his son and all he is destined to become. This somber ballad, which suffers from being, at times, too sentimental, slows things down drastically, but is a welcome reprieve from the tension found in the rest of the album’s heavy and hard-driving rock. Throughout the album, time, faith, love and loss are recurring themes in the lyrics. And while the album doesn’t explore any territory that hasn’t already been covered extensively in music, it is exactly what the title suggests, which is a no-frills rock record. No more and no less. That being said, it is a solid effort by a talented musician and composer that provides a most enjoyable listening experience for fans of rock music. So put it on, crank it up loud and sing along.